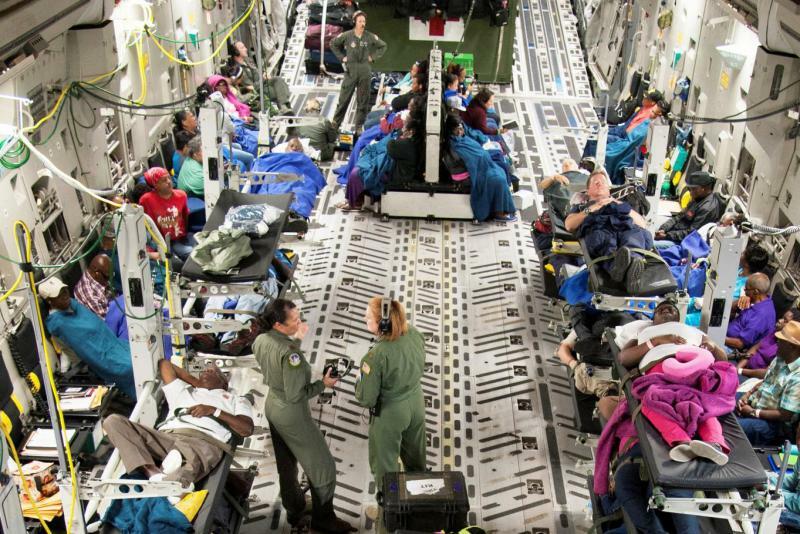 Pilots from the 45th Aeromedical Evacuation Squadron fly a C130 to evacuate patients from St. Croix. Julio Ochoa reports on medical evacuations from St. Croix, nine days after Hurricane Maria. The C130's four propeller engines scream as it lifts off from MacDill Air Force base in Tampa. 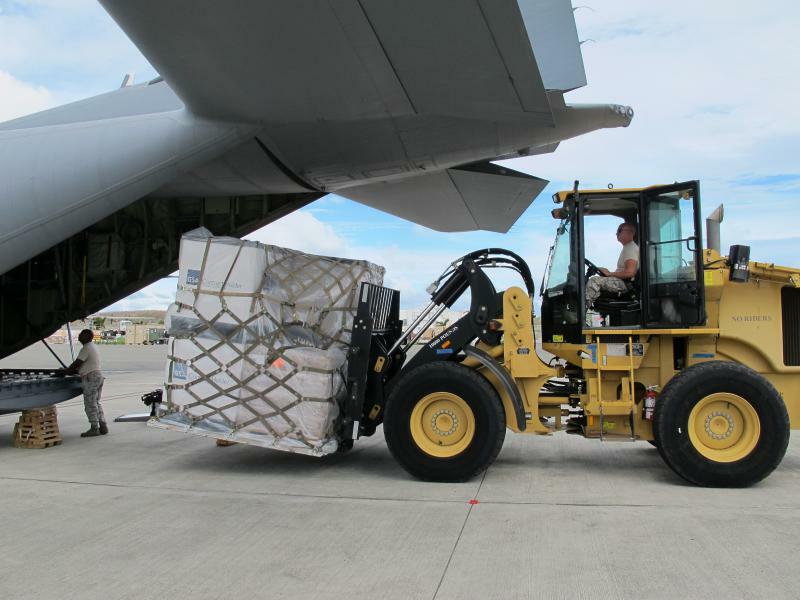 The plane is loaded with pallets of medical supplies bound for St. Croix, nine days after the largest of the U.S. Virgin Islands took a direct hit from Hurricane Maria. 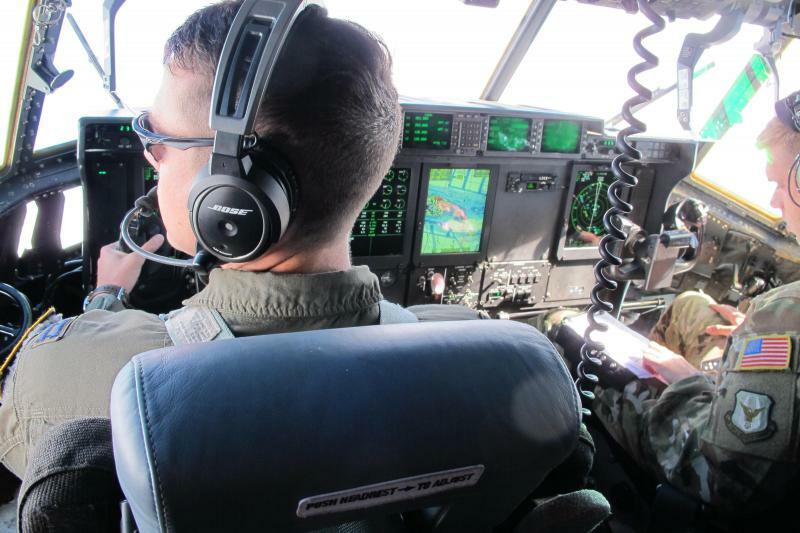 As the Caribbean recovers from Hurricanes Irma and Maria, the 45th Aeromedical Evacuation Squadron is doing what it's known for: dropping in on emergencies. But with this humanitarian hurricane response, the airborne medical team has shifted from the battle field to the battered shores of St. Croix. So far, hundreds of patients have been brought to hospitals in South Carolina, Georgia, Louisiana and Mississippi. Capt. Michael Plash is in charge of the flight crew. He spoke from the plane's flight deck on the approach to St. Croix. "It's a massive operation that's going on," Plash said. "We have aircraft in and out, left and right, I mean it's crazy." It's the crew's second mission to the island in three days. Maria blew down buildings, disfigured trees and left a field of debris across St. Croix. Much of the island is without power and running water. "It kind of looks like an aerial shot where a tornado went through, but more widespread," Plash said. Four hours after taking off, the C130 touches down. The engines keep running as a forklift removes the pallets of supplies. A patient is taken off a medical evacuation flight from St. Croix that arrived in Atlanta. The crew then quickly converts the plane's fuselage into a mobile emergency room. Stretchers stacked three high run down the spine. Bags of medical equipment hang from the walls. Machines monitor vital signs. 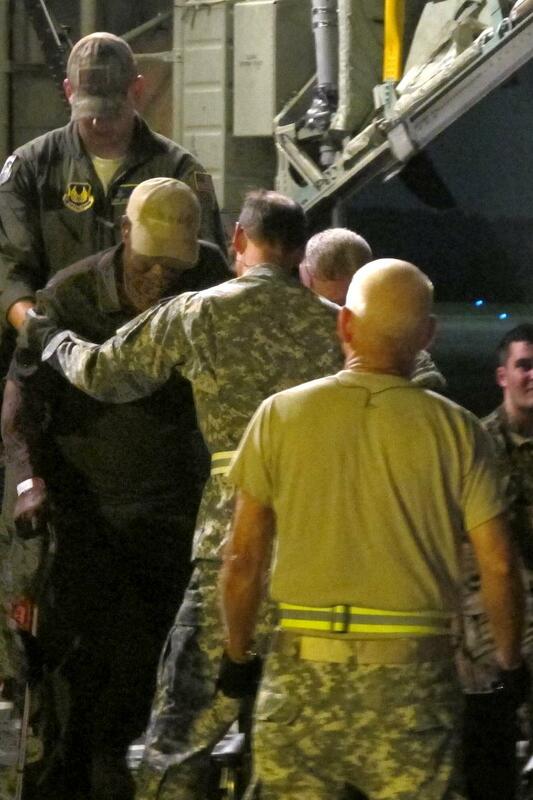 Nine patients, some in wheelchairs, others on stretchers, board the plane and the medical staff starts caring for them. Capt. Keri Lord-Morales leads the medical crew of flight nurses, doctors and a special critical care team. "We have patients who have chronic illnesses that require dialysis and we have other things such as wounds that we are dealing with and mental health issues as well," Lord-Morales said. Earl Shervington is one of the dialysis patients heading to the mainland. The 61 year old, who was born and raised in St. Croix, has failing kidneys and depends on machines to clean his blood three times a day. Sitting on a stretcher inside the C130, Shervington says officials feared the hospital where he received dialysis would lose generator power. "So what the government decided is to ship us out to somewhere that we can seek better help, which I think was a very good decision and a very good idea," Shervington said. Lord-Morales says treating patients in the air comes with challenges that caregivers don't have on the ground. There's lower oxygen levels, temperature fluctuations and vibrations that can effect pain. She says patients can also become dehydrated. "Those can affect their entire well-being and can change their status at any time," she said. The members of the medical crew are reservists and many were working at hospitals throughout Florida when they got the call to serve. Capt. Sandy Mandell is a trauma nurse at Orlando Regional Medical Center. Much like the staff in an emergency room, she says, the medial flight team doesn't typically know what types of patients they'll be treating ahead of time. "We were told we were getting one patient load on the way down and we showed up and it completely changed, so flexibility is like a huge part of our job," Mandell said. During the flight, a nurse on the plane coordinates with the hospitals in South Carolina. When the C130 touches down in Columbia, crews on the ground take over. A second trip to Atlanta an hour later drops off the remaining patients. After roughly 12 hours of work, the crew can rest for the night. The next day, the team returns to MacDill. There, another crew is already set to go, ready to rescue another group of patients.